These beautiful birds are approximately 13 inches long and have a barred brown back, a buffy breast with black dots, salmon red coloring under the wings and tail, and a black “necklace”. Male Flickers have a red “mustache” near their bill that the females lack. Like other woodpecker species, insects make up a large portion of the diet of Flickers. Not only do flickers drill holes in trees to access insects, they also catch insects such as ants on the ground. Like many insect eating birds, Flickers can be fed by offering suet or bark butter. Flickers eat more seeds and nuts than many other woodpecker species, and will also visit birdfeeders offering black oil sunflower seeds, shelled sunflower chips, or shelled nuts. While beautiful, Flickers occasionally become a nuisance by pecking on people’s homes. They do this for a two reasons; either they are drumming to broadcast their territory and to attract a mate, or they are attempting to excavate a cavity for nesting or roosting. As spring approaches birds begin the process of raising families. For birds, this starts with courtship. Oftentimes, the first courtship activity in which birds engage is singing. Unlike many smaller bird species we observe in our yards, woodpeckers do not have singing voices that they use to attract mates. Rather woodpeckers use repeated rhythmic pecking known as drumming to broadcast their territory and attract a mate. Louder drumming better serves its needs, so woodpeckers often times search out surfaces such as metal gutters, chimney tops, or wooden shingles that resound nicely. Fortunately, the woodpecker is not intending to make a hole, so while annoying, drumming usually does not damage the home. The same cannot be said if a Flicker is pecking on a home with the intent of excavating a cavity for nesting or roosting. Unlike drumming, pecking to excavate a cavity tends to be irregular and arrhythmic in nature, and the birds will be making a visible hole. The Northern Flicker is a primary cavity nester, which means that it will excavate its own cavity to use for nesting or roosting. In nature, Flickers use standing dead trees in which they excavate their cavity. These snags can be in rather short supply, especially near cities and towns where they tend to be viewed as a hazard or an eyesore and are cut down. While there may be a dearth of natural standing dead wood around humans, there is an abundance of wood siding on people’s homes. Unfortunately, wood siding, as well as hardiplank and even stucco, can be viewed by Flickers as suitable surfaces in which to excavate a cavity. One of the best ways to stop Flicker damage to a structure is to put up an appropriately sized bird house. 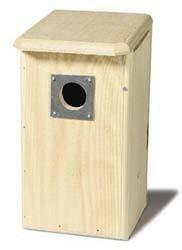 This ready-made nesting or roosting cavity has the entrance hole size and interior dimensions that they birds prefer. Providing this suitable nesting spot removes the need for the bird to excavate holes on the house. 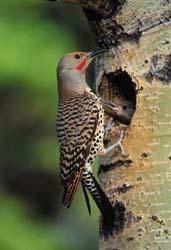 In addition, nesting flickers are territorial tend to prevent other flickers from coming and damaging the home. The greatest success is usually achieved by placing the nesting box as near as possible to the spot on the home that the birds have chosen. Mount the box either directly on the home, or on the trunk of a large nearby tree. We recommend filling the nesting box with wood shavings, as this helps satisfy the Flickers desire to peck and provides nesting material. To minimize drumming, or to encourage the birds to cease pecking on a home and use a recently mounted nesting box, there are a few effective deterrent methods. Windsocks, particularly those made of a reflective mylar material, tend to be avoided by the birds. The combination of the movement and the reflection of light from the shiny mylar material oftentimes deters the birds. This mylar material is available at Wild Birds Unlimited as a windsock, or as a 100 ft ribbon that can be cut and mounted where needed. When using the ribbon we recommend twisting it and hanging such that it will move in the breeze. Netting, such as that used to stop birds from eating fruit from trees, can also be hung on the house to prevent the Flickers getting access. Avoid plastic owls, as the Flickers tend to quickly realize that this “bird” never moves and is not truly a threat. Also avoid bitter-tasting sprays, as they are expensive, need to be reapplied frequently, and are rarely effective. The Northern Flicker is a fascinating bird to watch in our yards. Like many other bird species, they help to keep insect populations in check. By taking a few simple steps, everyone can coexist with these beautiful birds. For further information visit Wild Birds Unlimited at the Forum Shopping Center in Bend or call us at (541) 617-8840.